Hemet Appraiser - Hemet FHA Appraisals - Hemet REO Appraisal - Hemet Estate Appraisals - Hemet Divorce Appraisal. The area in which Hemet is located was first inhabited by members of the Cahuilla Indian tribe. Then, in the early 1800's, it became a cattle ranch for Mission San Luis Rey and was called Rancho San Jacinto. When the missions were broken up by the Mexican government, the land was awarded to Jose Antonio Estudillo in 1842. The City of Hemet owes its inception and initial growth to two ironic events and the dedication of two wealthy men. The first event was the visit that Ramona author Helen Hunt Jackson made to the San Jacinto Valley in 1883 in order to gather material on the Sobobas, a group of Mission Indians living on the east side of the San Jacinto River. Mrs. Jackson was accompanied to the valley by her interpreter, Abbot Kinney. During their visit, Jackson and Kinney stayed at various ranches and met numerous valley and mountain residents, notably Charles Thomas and Hancock McClung Johnston. Thomas and Johnston owned ranches in the San Jacinto Mountains where they raised race horses in what was then called Hemet Valley. From these two men and others, Kinney undoubtedly learned about the 1882 court case wherin the lands of the Rancho San Jacinto Viejo were partitioned to various individuals, some of whom envisioned making a profit from their holdings if a sufficient water supply could be developed. Kinney also learned about and saw a potential reservoir site in Hemet Valley if a dam was constructed across the South Fork of the San Jacinto River. From this visit and others, Kinney and Johnston conceived the idea of forming a company and procuring valley lands. Incorporated under the laws of the State of California, the Lake Hemet Company, with Kinney as president, entered into an agreement on July 8, 1886 with Francisco Estudillo (the youngest son of the original owner of the Rancho San Jacinto Viejo) to buy 3,000 acres of Estudillo land from which the townsite of Hemet would eventually evolve. 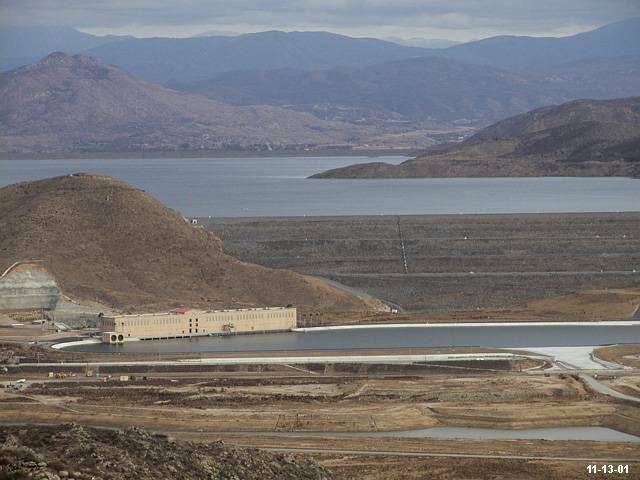 Whether persuaded by others to give up, lacking sufficient funds, or just disinterested, the Lake Hemet Company pulled out of the deal with Estudillo. The next day, October 15, 1886, Estudillo sold the 3,000 acres to three other men, Edward L. Mayberry, Albert H. Judson and Peter Potts, under the same terms as those with the Lake Hemet Company. Originally conceived by Abbott Kinney and Hancock M. Johnston, the town of Hemet would now evolve under the watchful eye and ready money of E.L. Mayberry and later, W. Whittier. By December of 1886, Mayberry, Judson and Potts had sold some of their interests in the Estudillo tract to Hancock M. Johnston. Also in that same month, the four men and a San Francisco capitalist friend of the Mayberry's, William Whittier, acquired another 3,000 acres adjacent to and east of the Estudillo tract from H.T. Hewitt, who owned a hotel and some shops in San Jacinto, about a mile north of Park Hill. The Hewitt agreement included a stipulation that a townsite would be located on or near Park Hill. The Hewitt property provided the basis for the formation of two companies. On January 27, 1887, the Lake Hemet Company and the Hemet Land Company were formed by Johnston, Judson, Mayberry and Whittier, the latter two holding the majority of stock in both companies. The original plans were to build a dam in the mountains to form a reservoir in order to supply water to the lands of the Hemet Land Company, the Estudillo tract and two townsites, Hemet and South San Jacinto. During 1887 plans were made to lay the first railroad tracks into the San Jacinto Valley. Mayberry and Whittier wanted the Santa Fe Company to run the tracks through the Estudillo tract, to the east line of the Hemet Land Company lands, and then north and west to the town of San Jacinto, thus providing railroad access to Hemet and South San Jacinto land buyers. Instead, the first official train into the valley came in April 1888 to Mayberry's townsite and then turned north, ending at a spot one-half mile from the town of San Jacinto. During the years 1891 - 1895, while the Great Hemet Dam was being built to 122-1/2 feet, the town of Hemet started to take on a look of prosperity. Mayberry built his three-story brick Hotel Mayberry on Florida Avenue between Harvard and State Streets; Whittier built a warehouse, his opera house, and business shops on North Harvard. In 1893, 39 families and businesses in the town of Hemet were buying domestic water from the Lake Hemet Water Company, and farmers were using irrigation water on their alfalfa fields, fruit orchards and row crops, particularly potatoes. Despite a severe drought in 1898-1900 and a major 1899 Christmas Day earthquake, the town of Hemet continued to prosper. In 1899 Whittier sued Mayberry for monies owed him, taking control of all of Mayberry's interests in Hemet and in the two companies. Whittier, however, continued to improve the town's position. He started the Bank of Hemet,, built rental cottages and a stock farm with a half-mile race track, established and supplied by the town residents and electricity, a water filter system, and a stage line to Idyllwild. On November 14, 1909, the San Jacinto Valley Register printed a synopsis of a speech by T.S. Brown, a Hemet real estate agent, in which he urged that the town residents vote for incorporation. On January 11, 1910, residents voted to incorporate as a city, and Brown was elected Hemet's first mayor. Formal incorporation was recorded with the County of Riverside on January 20, 1910. Since 1923, one of the valley's chief claims to fame has been the annual Ramona Pageant. The incident which inspired Helen Hunt Jackson to write Ramona occurred in the valley, and the production of a pageant based on the story was discussed for a number of years as a method of promoting the valley. From 1923 onward, with only brief interruptions during the Depression and during World War II, the people of Hemet and San Jacinto have joined to stage this outdoor pageant each spring. Hemet was also noted for the 46th Agricultural District Farmer's Fair of Riverside County, which had its beginning in 1936 as the Hemet Turkey Show, and for the Ryan School of Aeronautics, which trained about 6,000 fliers for the Army Air Force between 1940 and 1944. Hemet Ryan Airport exists today at the site of the original Ryan Flight School. The character of Hemet began to change dramatically in the early 1960's with the development of Sierra Dawn, the country's first "mobile home subdivision" in which individual lots were sold. Other mobile home parks and retirement housing developments followed, and Hemet became well known as a retirement community. Hemet today retains much of its retirement orientation but is also becoming home to significant numbers of younger families who provide services to the senior population or who are simply fleeing the more urbanized areas of Southern California. The economy is based primarily on service to the senior community and ancillary services such as financial institutions and the health care professions. From the City of Hemet website. There are many reasons to obtain an appraisal for a property in Hemet, CA. The most common reason is for a real estate or mortgage transaction, but we have compiled a list of other reasons you may need to order an appraisal. With over 14 years experience in the region, MGK Properties can provide the highly qualified certified appraiser for your appraisal requirement.